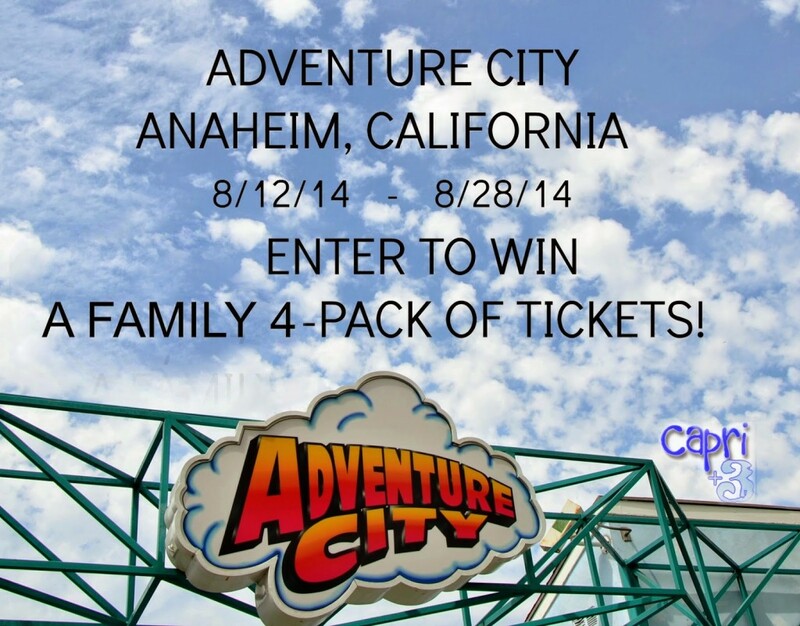 Disclosure: We were given tickets to Adventure City for our family and the family 4-pack of tickets for this giveaway. No other compensation was given. We recently had chance to have a blast at Adventure City in Anaheim, California. It is the “Little Theme Park that’s BIG on Family Fun.” It is perfect for preschool to about seven years old. There is a train ride, a carousel and more. Click the link below the photo to read my review. CHECK OUT MY REVIEW OF ADVENTURE CITY TO SEE LOTS OF PHOTOS AND LEARN MORE ABOUT THE PARK! Now, on to the giveaway. 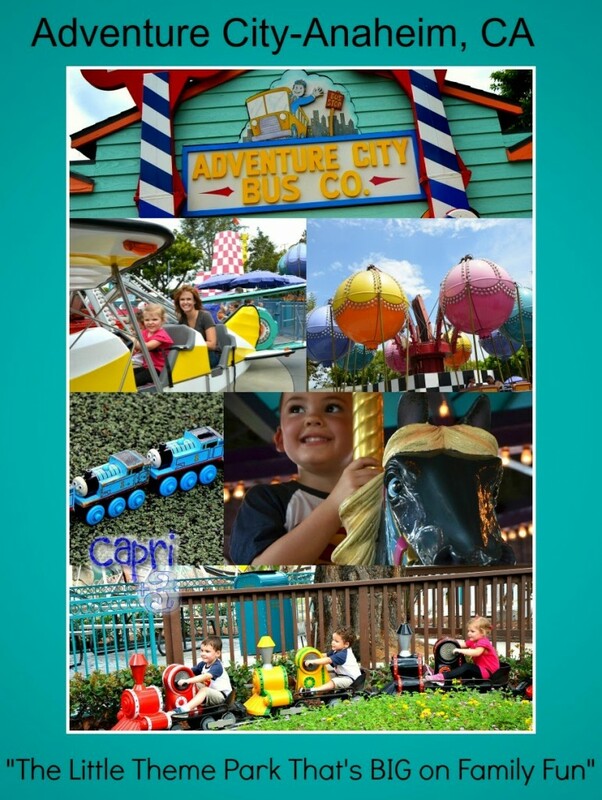 Adventure City has generously offered Capri + 3 readers the chance to win a Family 4-Pack of Tickets to the park! If you have never been, you are in for a treat. If you’ve already been there, then you know this is a great giveaway. There are many options to win, including some from three wonderful California blogs that have joined forces with Capri + 3 to share the news about this giveaway! The more entries you choose to do, the more chances you have to win. Contest Information: Capri + 3 is not responsible for prize fulfilment. The 4-Pack of tickets is generously provided by Adventure City. The contest is open in the United States (only). The winner will have 48 hours to respond to the email notification. If the winner does not respond within 48 hours, an alternate winner will be chosen. Winner will be chosen via Random.org. I will never forget the trip to Adventure City 5-6 years ago. I had my son and my two oldest nieces on Adventure Drop while I was playing with my youngest niece down below. She got stung by a bee! ACK! Unfortunately, we had to cut our visit short, but the kids STILL talk about that visit. Bee stings are terrible. And you always remember where they happen. Hopefully, you will get the chance to go back and have a much better experience…all fun and no bees.